Hi there! If you're new here, you may want to subscribe to my weekly update email or RSS feed. Thanks for visiting! Jewelry, candy, and flowers are the staple gifts of Valentine’s Day, but bonus points are always given to those who thoughtfully go outside of the box with their Valentine’s Day gifts! I’m not suggesting you go full on practical with your gift like shelves or storage bins, just look outside the usual trappings. Precious Moments has some adorably lovable figurines for your favorite Valentine that you can mix things up with! When you mention Precious Moments, almost everyone can picture one of their adorable children figurines. Precious Moments has been spreading the gift of love through their many collections since 1978! They’re not everyone’s cup of tea – heck I used to think their eyes were a bit creepy myself – but I’ve come around to how cute and sweet they can be. The pastel colors really make these cute designs full-on adorable. 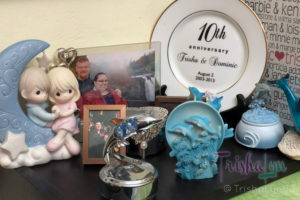 I was given the opportunity to pick out a figurine from their Valentine’s Day collection and it was HARD! 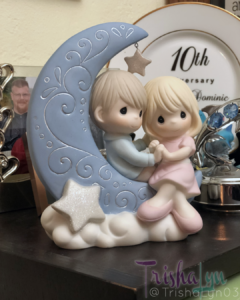 There are a lot of cute ones, but I finally went with my love of celestial themes and picked out the “I Love You To The Moon And Back” Bisque Porcelain Figurine. The figurine came well packages with form-fit Styrofoam in the product’s box and air bags securing the product box within the shipping box. There was little worry that the figurine might be damaged when I saw the packaging. It was slightly larger than I realized it would be, but going back I did see that it measures 6.75″ high, so I guess I should have paid more attention! The color of the moon itself is a bit more muted in person than in the product photos, but it’s not out of line with the rest of the pastel colors of the figurine. The star above the couple’s head is actually attached to dangle and was well wrapped itself when I opened the package. The bisque porcelain has a nice matte finish, but the silver swirls on the moon are metallic and the stars have a very fine glitter on them. Don’t panic – I rubbed my finger against the bigger star and none of the glitter seemed to come off. It’s hollow inside, so it’s not too bulky and could easily be displayed on a light shelf. The couple really looks like they’re separate pieces that were fused to the rest and not sculpted as all one piece, which is a nice attention to detail. They don’t at all feel like they’d separate or fall off at all. My favorite part of this particular figurine is that, while of course evocative of love, it’s not so Valentine’s Day themed that it would feel like a piece of seasonal decor I could only display for a few weeks. It’s a timeless design I’ve happily made space for it on a shelf with love trinkets already! My one criticism of the craftsmanship of the figurine is that the dangling star seems like it was supposed to be installed closer to the tip of the moon, instead of about 1/2″ in. Where it is, it doesn’t hang straight and if bumped has a tendency to rest one point on the boy’s head instead of hanging. I have two issues with the colors, which are more personal issues and not necessarily problems with the product. As I mentioned, the color of the moon in the product shots looks to be a deeper blue purple and in execution it’s a lavender. If it had been a deeper purple, it would have been even more perfect for me since our wedding colors were royal purple and silver. My second issue is also very personal – I really wish their site had different options with different hair colors. I’d have loved to get it with the same hair color on the boy but a dark brown hair on the girl, again to be more personal to my husband and I. All in all, I feel like the size, quality, and design of this figurine is definitely well worth the retail price of $80.99. If you order through my link, http://www.trishalyn.com/ILYMB and use code BEMYVALENTINE you will save 20% off your precious Valentine’s Day gift! This offer expires February 14th, 2018 and you’ve already procrastinated this long so you should probably take care of that now!